Dense Words: Warning! Part Two. That is the same image as yesterday. Just to be on the safe side. 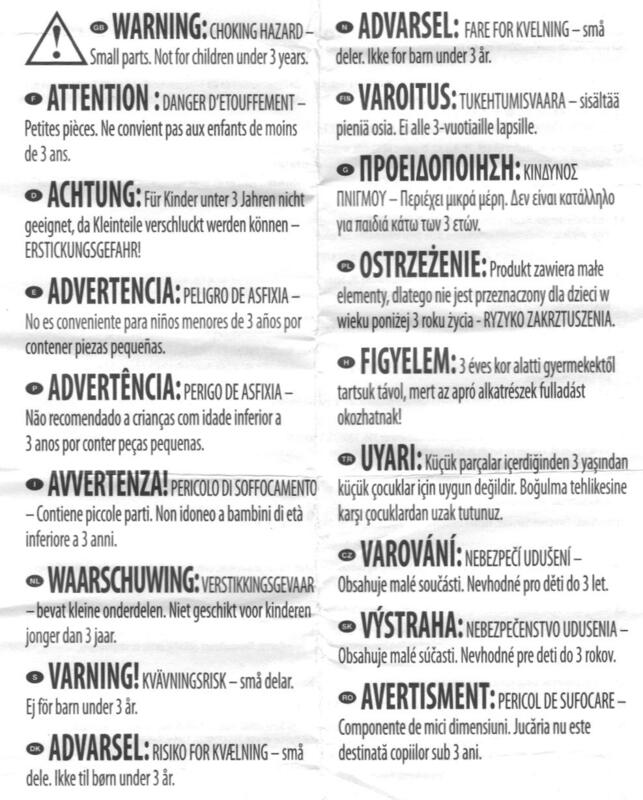 Spanish, Portuguese, Italian, Danish, Norwegian, Romanian and Slovak all seem to be using the same latin root "vert" - "warn". Not surprising for E, P I and RO. French, of course, has to be different, and is using a different Latin root "tend" - to reach towards. The Greek, Polish and Hungarian are both Greek to me. The Turkish (TR) may well be the same as English. The next word is "years". Polish and Slovak share roku and rokov, though lat is also used in Polish (e.g. pięciolatek - a five-year-old, and Sto Lat! a popular Song, meaning 100 years), and is the same as let used here in Czech. Finnish, Hungarian's main competition for uniqueness is the winner here. The English word has no modern relatives but can be traced back through English to "Proto-Germanic" (P.Gmc), an imagined common ancestor of the Germanic languages. So for once, English wins the uniqueness prize. 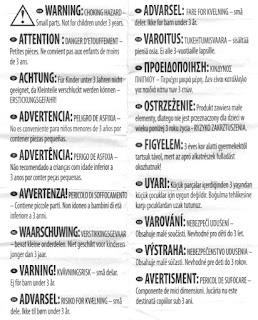 Languages generally find their most and least unique words in their most commonly used words - which is why this warning notice is such a special case. In almost all these languages, the most familiar terms possible are used. Even French has a hard time being wordy, pompous and obscure. The German word kinder is the plural of kind, meaning child. This is also traced back to P.Gmc, but not unique as the English words kin (family) and kind (of a type) are both direct descendants of the same P.Gmc root, and indeed closer to its original meaning of "blood relative". Dutch uses the same word. The French enfant is the English word infant, both of them come from Latin infans which means (figuratively) small child and literally means "not having yet acquired the power of speech". Spanish and Italian have recently (for languages, at any rate), replaced the use of this word with infantile diminutives: niños and bambinos, though forms persist with the meaning "childhood". Portuguese uses crianças - which I can translate into French (nourrisson) but English is trickier. Czech and Slovak share the slav det - which is also the root of the Russian word. Swedish, Danish and Norwegian all use variations of barn. The Scottish word bairn and the English words bear and born are all from the same root, which comes, again, from P.Gmc, this time a word meaning to carry, bear, give birth to. S, DK and N all share små - small. Pronounced "smor". The Dutch for "Younger than three years" is jonger dan drie jaar. Just say it aloud (the 'j', is pronounced as an English 'y'). All this to show just how much time I can end up spending whenever I mark up my client's manuscript with that little code "ic". This stands for inconceivable. "Are you sure it doesn't/does mean that, really?" they ask me, in defence of inconceivable usage. So I have to go trawling through current usage and etymology and whatnot, before either concluding YKB (you know best) or OYHBI (on your head be it).